With its white-sand beaches, reefs, rain forests and adventure, Central America is a hot bed for vacationers. 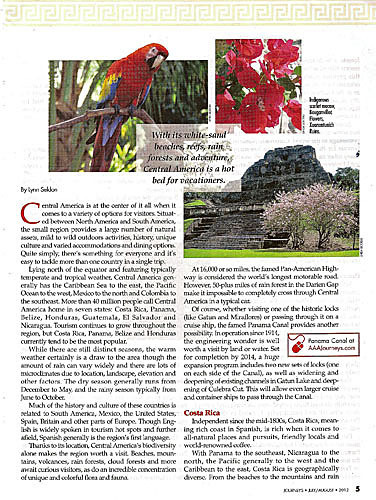 Central America is at the center of it all when it comes to a wide variety of options for visitors. Situated between North America and South America, the small region provides a large number of natural assets, mild to wild outdoors activities, history, unique culture and varied accommodations and dining options. Quite simply, there's something for everyone-and, it's easy to tackle more than one country in a single trip. Lying north of the equator and featuring typically temperate and tropical weather, Central America generally has the Caribbean Sea to the east, the Pacific Ocean to the west, Mexico to the north, and Colombia to the southeast. More than 40 million people call Central America home in seven states: Costa Rica, Panama, Belize, Honduras, Guatemala, El Salvador and Nicaragua. Tourism continues to grow throughout the region, but Costa Rica, Panama, Belize, and Honduras currently tend to be the most popular. While there are still distinct seasons, the warm weather is certainly a draw to the area though the amount of rain can vary widely and there are lots of microclimates due to location, landscape, elevation, and other factors, the dry season generally runs from December to May. and the rainy season is typically from June to October. Much of the history and culture of these countries is related to South America, Mexico, the United States, Spain, Britain and other parts of Europe. Though English is widely spoken in tourism hotspots and further afield, Spanish generally is the region's first language. Thanks to its location, Central America's biodiversity alone makes the region worth a visit. Beaches, mountains, volcanoes, rainforests, cloud forests and more await curious visitors, as does an incredible concentration of unique and colorful flora and fauna. At 16,000 or so miles, the famed Pan-American Highway is considered the world's longest motorable road. However, 50-plus miles of rain forest in the Darien Gap make it impossible to completely cross through Central America in a typical car. Of course, whether visiting one of the historic locks (like Gatun and Miraflores) or passing through it on a cruise ship, the famed Panama Canal provides another possibility. In operation since 1914, the engineering wonder is well worth a visit by land or water. Set for completion by 2014, a huge expansion program includes two new sets of locks (one on each side of the Canal), as well as widening and deepening of existing channels in Gatun Lake and deepening of Culebra Cut. This will allow even larger cruise and container ships to pass through the Canal. Independent since the mid-1800s, Costa Rica, meaning rich coast in Spanish, Costa Rica is rich when it comes to all-natural places and pursuits, friendly locals and world-renowned coffee. With Panama to the southeast, Nicaragua to the north, the Pacific generally to the west, and the Caribbean to the east, Costa Rica is geographically diverse. From the beaches to the mountains and rain forests, a wide range of resorts take advantage of this premier outdoors-oriented location, as well as in the bustling capital city of San Jose, where culture and history take center stage instead of nature. About 25% of Costa Rica's landmass has some sort of protected status--the highest percentage in the world. Corcovado National Park is justly famous for its diversity and thus has many tourists. But many other varied parks also are well worth a visit including Monteverde Cloud Forest Reserve, Tortuguero National Park, Arenal Volcano and varied beaches like Montezuma and Playa Tamarindo. Activities can include nature walks, bird-watching and other wildlife viewing, kayaking and rafting, beach time, famed canopy zipline tours and much more. Busy San Jose is definitely worth a visit as well, thanks to its history and culture. Highlights have to include the National Theater, the Jade Museum, the Central Market; and a cup of Costa Rica coffee at one of the city's many popular cafes. While the Panama Canal is reason enough, the country of Panama has much more to offer visitors. With Costa Rica to the west, the Caribbean to the north, the Pacific to the south and Colombia to the east, Panama is the last country in Central America before entering South America. Panama was greatly influenced by Spain and then Colombia, before gaining independence in 1903. Home to wildlife and plants found in both North America and South America, Panama's natural assets (especially in the jungle) are likely the most diverse in Central American--and that's really saying something. Visitors to Panama will invariably hear about the native Kuna people of the remote San Blas Islands. Popular as a cruise ship stop and on excursions from mainland Panama, the colorfully dressed Kuna people enjoy showing (and selling) their artwork and handicrafts. 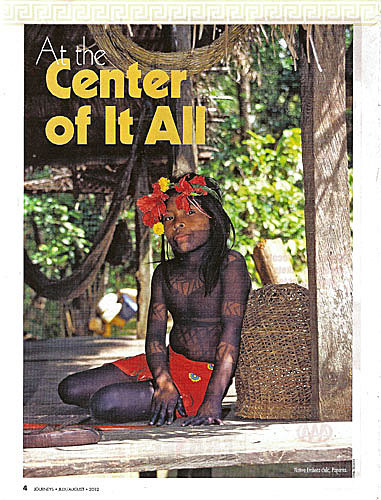 Located in the Darien Province, the equally interesting Embera Indian population welcomes visitors interested in their culture. Panama City is often visited overnight before or after more natural pursuits. Highlights include centuries-old Old Panama, the Cathedral, the president's Heron's Palace, and the interesting Museo del Canal (Canal Museum). Designed by Frank Gehry, the new BioMuseo (Museum of Biodiversity) is set to open in early 2013. Colonial Portobelo is also well worth a visit, including the Royal Treasure House, the Real Aduana (Customs House), and lots of Spanish Colonial architecture. Panama's strategic Central America location has meant it's historically been a hotbed for military action and resulting forts, including historic Fort Jeronimo and Fort Santiago. Thanks to an incredible array of possibilities on land and especially above and below the surface of the crystal-clear Caribbean Sea to the east, Belize continues to grow in popularity. With its British Colonial heritage, English is the official language and widely spoken--though Spanish is the local language. Boasting the smallest population in Central America, Belize is packed with outdoors opportunities and more. A strong Mayan history means ruins like Caracol and Xuanantunich are popular with visitors, as are waterfalls, sandy beaches and the most extensive system of easily explored caves in Central America. Those exploring Belize's jungles will want to look for the country's colorful national bird--the Keel Billed Toucan. However, many visitors come to Belize specifically for its underwater world. At about 200 miles in length, the Belize Barrier Reef is the longest reef in the Western Hemisphere and the second longest in the world (behind Australia's Great Barrier Reef). Resorts and dive operators cater to visiting divers and snorkelers in a big way, including trips to Belize's famed Great Blue Hole and much more. With the Caribbean to the north, Guatemala to the west, El Salvador to the south, and Nicaragua to the east, Nicaragua has strong Mayan and Spanish heritage. As with the rest of Central America, Honduras features lots of plants and animals found in the mountains, rain forests, jungles, along the coastlines in preserved areas and out on the Bay Islands. The island of Roatan continues to grow in popularity (including cruise ship visits), as do visits to Jeanette Kawas National Park and the Yojoa Lake region (several national parks and classic waterfalls). The Rio Platano Biosphere Reserve, a rain forest in the lowlands, was declared a UNESCO World Heritage Sites back in 1982.